Watermelon Lemonade for the summer is finally here! The last two weeks of heat and I believe the summer is finally here. It is hot, humid, the fans are running non stop and a part of me is constantly looking for something cool to drink. Even Lil A comes and asks "Are you really, really thirsty?" waiting for me to say yes, so he can say "so am I." He will then go on to have a glass of water with me. Even Tiny M will see his sippy cup with water and start saying "de de (give, give)". So a couple of days ago, I was making lemonade to go with evening dinner. I got the ingredients together - sugar, lemons and then my eyes rested on the mini watermelon that has been sitting on the counter for good 4-5 days. I hit upon the idea of watermelon lemonade and quickly got to work. 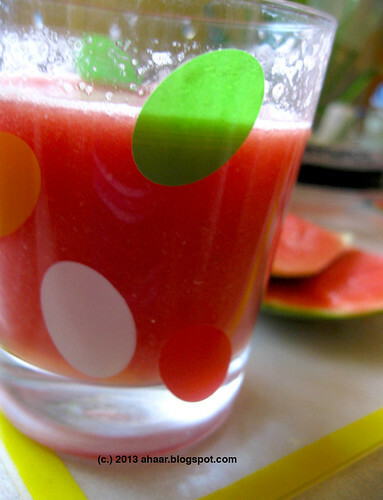 I pureed the watermelon till I had a puree almost like juice. I didn't sieve it, but you could and them mix it with the lemonade. The result was something unique and delicious. Lil A liked and drank his cup quickly. The little one got a few sips and I even froze little bit for popsicles which were met with "oohs and aahs" the next day. Chop the watermelon and puree it with the ginger and water till most of the lumps are gone. In a bowl make a sugar and lemon syrup with 1/2 cup water till the sugar dissolves. 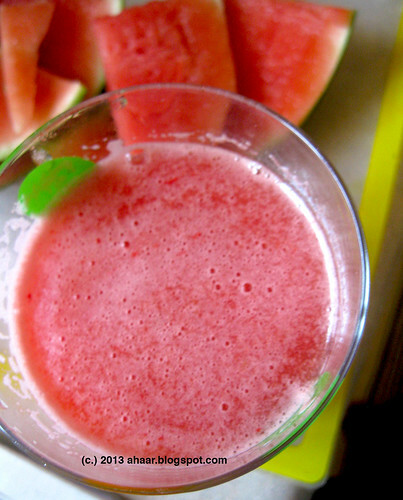 Mix the lemon and sugar syrup with the watermelon puree. Add some ice and serve cold. Enjoy the Labor Day weekend. This is one of the first recipes I made when I came to the US. This and aloo phulkopi (potato and cauliflower). We were four girls staying in a small apartment in Boston from different parts of the country. We had never met before, but were going to spend time studying at and living together. Adjusting to the new place and a full course load kept us busy throughout the day. It was only in the evening that we would relax a little, chat, catch up and cook. We took turns cooking. We were novices, cooking with recipes, or with a taste in mind. There were accidents and successes and we slowly got better. I will regale you with some of the stories later. The menu was rather simple in those days, but I look back rather fondly. 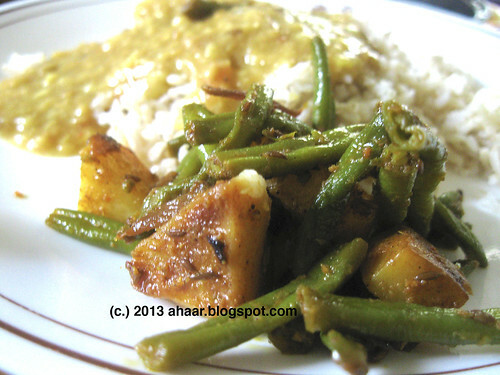 A and I joined forces a few times a week when it was our turn and it was during those evenings that I perfected this recipe and had it with dal or rajma and rice. 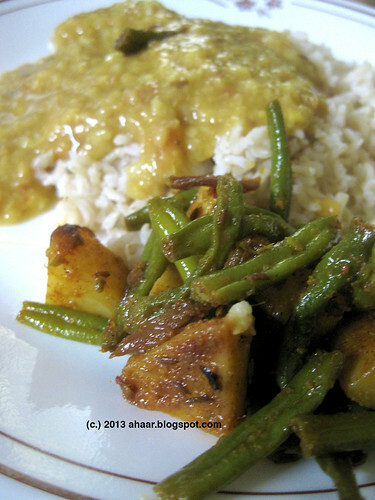 It tastes the best when the masala is all soaked up by the potatoes and the beans. When the summer is in full-swing, I get fresh green beans from farmer's market, and in winter's I use the frozen green beans for the stirfry. It's simple and quick and perfect for a weekday lunch or dinner. Keep the chopped potatoes and beans seperate. Heat oil in a deep pan and temper it with asafoetida. Then add the cumin seeds and the green chillies. Saute for a minute till the aroma comes and then add the ginger and the turmeric powder. Add the potatoes and saute for 3-4 minutes till potatoes take a glaze. Now add the green beans, cumin seed powder and the chilli powder. Cover and let it cook for 3-4 minutes covered on low heat.. Now add salt, water and let it cook for another 4-5 minutes on medium heat. Do not cover and let the water evaporate. The stir fry is ready once the water evaporates and the potatoes and beans are cooked. 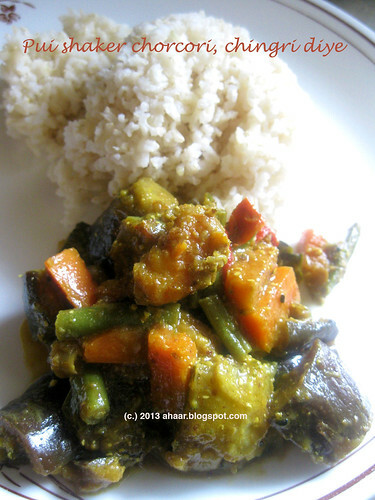 Serve warm with dal and rice or even chapati. How is your summer going so far? Hardly feels like summer if you ask me. With intermittent rain and cool nights, it doesn't feel like we had too many hot and warm days. 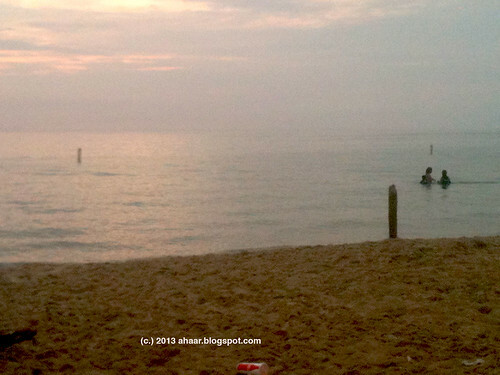 So I am extra grateful that the weather was perfect during all our outings to the beach. Lil A is a beach bum. He can stay there all day spending time digging out sand, making holes, watering them, and running in the water. We will have to wait and see how Tiny M reacts to the water. This time he spent most of his time watching his brother, the water and sea gulls from Baby Bjorn. He did get his feet wet several times when Lil A came out of the water and insisted on taking Tiny M there. My little backyard veggie patch is doing OK this year. I haven't had many tomatoes though. I had one good batch and now I am waiting to get another. But I haven't been lacking fresh and geen vegetables. Between Patel Brothers, Bombay Grocers, and the Farmer's Market I have been finding fresh greens and vegetables every week. Pui shaak is a new find at Patel Brothers. I was so excited to get it especially when my parents were here because of the anticipation of learning a new recipe. And I was not disappointed. I had Pui shaak-er chorchori, chingri diye. 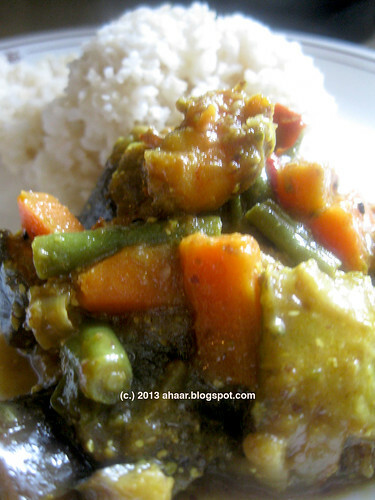 This chorchori can also be made niramish (without the chingri). Pui is a delicate green and melts nicely when it is cooked. It is also called Malabar climbing spinach and is used in all Asian cooking. Rub the shrimp/chingri with salt and turmeric powder and set it aside for 30 minutes. Heat 2 tbspoon oil and saute the chingri for 3-4 minutes. Set it aside. Heat the rest of the oil in a pan and temper it with panch phoron and then add the green chillies. Add all the vegetables one by one along with Pui shaak. Stir and cover and let it cook on low medium heat. After a couple of minutes, add the turmeric powder. Then add the salt and sugar. The shaak and the vegetables with start to release the water. Now add the mustard and poppy seed paste and cook for another 3-4 minutes. Open the lid, add the shrimp/chingri pieces, stir it together and let it cook with the lid for another 2-3 minutes. It's been nearly two years since I made an appearance here on Ahaar. I've been cooking, of course, but blogging fell by the wayside for a variety of reasons. But I've been inspired to give food blogging another go in part because Mandira and I have been exploring Yotam Ottolenghi's Plenty over the past few weeks. And given how much we like the recipes in the book, we've decided to launch a new series here - Cooking with Yotam! Needless to say, we're not going to simply reproduce recipes from Plenty. Besides, we're not the kind of cooks who plan meals based on recipes in a book. What we do most often is look for interesting new recipes and tweak them based on what's in our pantry. So, with due apologies to Yotam Ottolenghi if we're straying too far from his recipes, here's our first in our Cooking with Yotam series. 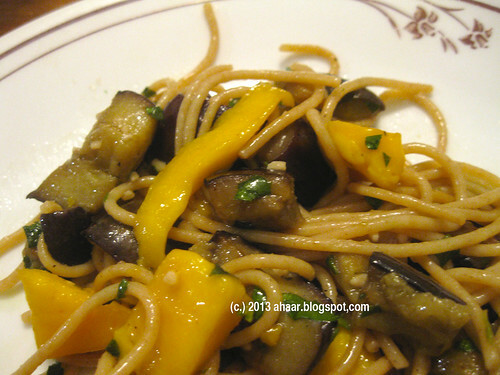 Having taken a quick look at our stock of fresh vegetables and fruits, I settled on 'Soba Noodles with Eggplant and Mango.' Perfect for a hot and humid summer day, I said to myself. Since this was an impromptu end-of-workday thing, I didn't have all the ingredients the recipe called for. But I did fine with I had in the fridge and the backyard vegetable patch. And it turned out to be a fantastic dish! Here's the recipe with my very minor tweaks. In a small saucepan, warm the vinegar, sugar and salt until the sugar dissolves. I took this off the heat, added the garlic and chili and set it aside to cool. Hold off on adding the lime juice until the very end. In a large skillet, heat up some canola oil and sautee the eggplant. Once they turn golden brown, transfer the eggplant to a colander, sprinkle them with salt and set them aside. The noodles can cook during this time (10-12 minutes for whole wheat spaghetti, slightly less for the soba noodles I would think). 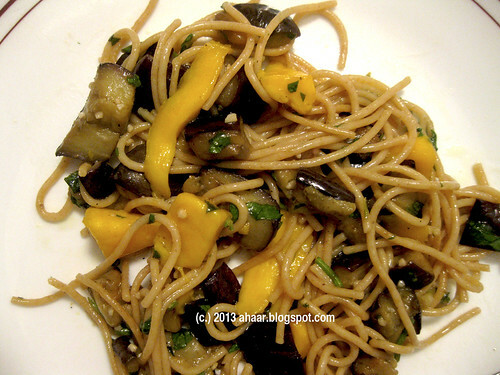 Drain the noodles and set those aside as well on a separate plate. 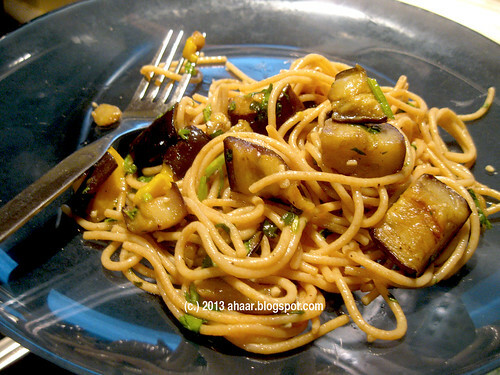 While Ottolenghi's recipe asks you to toss the noodles with the dressing, mango, eggplant, herbs and onion in a mixing bowl, I ended up mixing all this in the skillet (at low-medium heat) I used to saute the eggplant.